Bross Street Assisted Living is located just 4 blocks from a host of cultural and community events on the Main Street Corridor in Downtown Longmont. 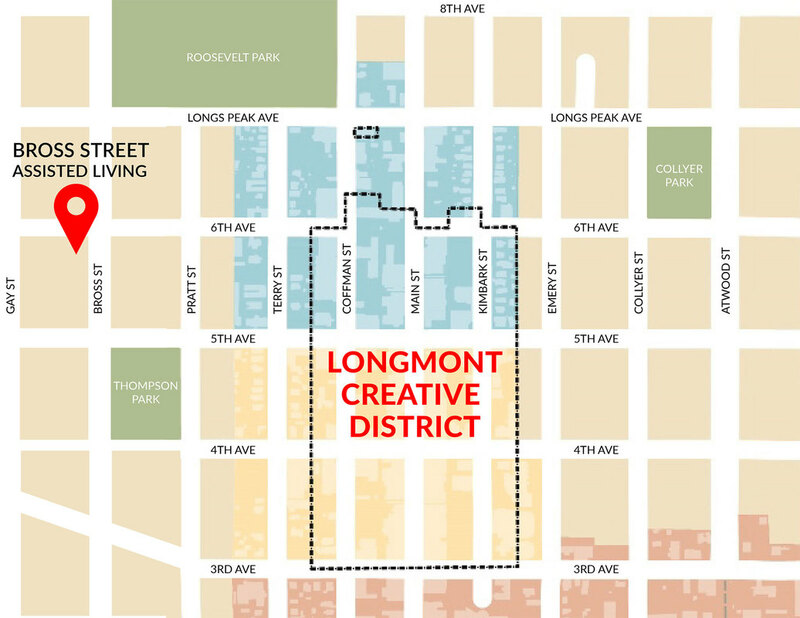 A coveted neighborhood to reside in, downtown Longmont offers a vibrant shopping and events district in a close-knit community with a small-town feel. At Bross Street Assisted Living, we offer daily opportunities to participate in local downtown events - from music concerts and parades to shopping and exploring the arts in one of the many creative venues that downtown Longmont has to offer. ​The SilverSneakers® Fitness program is Longmont's program to help senior citizens stay active. Those with Medicare can sign up and get access to group fitness classes and unlimited daily admission! This is a great way for Bross Street residents to stay active, live healthy lives and participate in the Longmont community. The SilverSneakers® fitness passes are good at the Longmont Recreation Center, Centennial Pool and St. Vrain Memorial Building. The Senior Center pass is only good for the SilverSneakers classes. For even more wellness activities in the Longmont area, check out the GO catalog! Interested? Contact 303-774-4800 or stop by any of the facilities listed above to learn more!